Brian L. Sullivan successfully turned a childhood interest into a career. 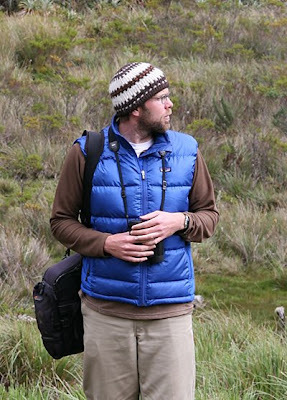 He now works as co-project leader of eBird, participates in field research, contributes to Cornell Lab of Ornithology's award-winning Sapsuckers team, writes the Ornithology 101 department in each issue of WildBird and pens occasional articles, such as the Swainson's Hawk species profile in this year's birds of prey issue (July/August). His mellow demeanor and low voice belie a quick dry wit that's a pleasure to observe, particularly when he expounds on citizen science or the joys of technology during the American Birding Association's annual convention. My parents were both outdoors enthusiasts, so my brother and I had our hands in the dirt at a young age. We stayed outside all the time and weren't allowed to watch TV until it got dark. This kind of childhood made me aware of what was around me, and birds were always a fascination. Once my mom and dad picked up on that interest, they fostered it by taking me to local nature centers, bird sanctuaries and ultimately to Hawk Mountain [in Pennsylvania], where I was amazed at the fall hawk migration. What’s your most unusual experience while doing field research? When I worked on San Clemente Island, the southernmost of the California Channel Islands, I would often find myself in the juxtaposition between the incredibly tangible biodiversity out there and the military training for which the island is known and preserved. On more than one occasion, I sat atop a seacliff 1,200 feet above the water, studying nesting Loggerhead Shrikes. Below me, the water was clear enough to see fish swimming among the kelp while a pair of 80-foot-long blue whales cruised by just offshore, all the while bombs exploding in the distance from ship-to-shore training maneuvers! Do you have a nemesis bird, and if so, which species? Northern Wheatear — I had to go to Alaska to finally see it! Once, while working as the hawkcounter at the Kiptopeke Hawkwatch on the eastern shore of Virginia, I got a call about a wheatear that had been found in Cape May. I struggled through two more days of counting and then raced to Cape May to see the bird. Of course when I got there, the bird had gone. I had a pleasant stay though, witnessing a few great Cape May hawk flights. On my return to Kiptopeke, however, the substitute counter had a photo for me — a Northern Wheatear sitting atop the Kiptopeke State Park entrance sign!!! The bird had been at the state park while I was gone and quite possibly was the same one that left Cape May two days before. When did you start photographing birds? I started to photograph birds in about 1995, primarily as a way to document the things I was finding. It's a great tool for sharing your observations with others. I also enjoyed what it did for my birding, which was to force me to pay attention again to common birds and spend more time observing behavior. I just don't know. I spent two weeks looking for them myself without a blip on the radar screen; however, there are some very talented people who have had encounters. The jury is still out for me. What is the most pressing issue for birders to address? I think birders need to understand the link between birds and habitat, and become more involved with preserving the environment that we have left. Birders need to be more conscious about what they are doing and try to move their avocation more in the direction of green technology and sustainability. Without the environment, the birds we love will disappear. My dream birding trip would be a cruise around the world with my four best birding friends in an attempt to see all the species of seabirds (tubenoses). I have a strong affinity for these birds; they are among the rarest and most enigmatic of all birds, and it takes a great effort to see many of them. It also takes a lot of time and money -- two luxuries that I doubt I'll ever find myself drowning in! Who’s eligible to participate in citizen science – backyard birders, listers, beginners, experts? The beauty of citizen science is that it is flexible enough to be used by birders of all skill levels and interest. In eBird, for example, we've specifically designed an interface that appeals to both backyard birders and the country's birding elite. Whether you just want to watch birds at your feeders or travel the world in search of the rarest species on the planet, tools like eBird are built to harness your effort and then put your data into the hands of scientists and conservationists working to preserve birds and biodiversity. Seeing thousands of road-killed Horned Larks and longspurs along the highway after a big snow storm hit in the Great Plains. Who do you consider your birding mentors? While my parents certainly shaped my introduction to the natural world, and still do, Jack Connor (author of "Season at the Point" [Atlantic Monthly Press, 1994] and "The Complete Birder" [Houghton Mifflin, 1988]) rekindled my love of birds after a long absence in high school and early college. Jack helped me find the spark that sets us off on a life of birding, and for that, I'm forever grateful. He took pity on me and gave me a 'C' in his Biology of Birds class at Stockton College, even though I should have failed because I was too busy out birding and discovering the natural world to ever make it to class! Tim Gallagher's got "Falcon Fever"
Winners! We got yer winners here!